The world is watching one volcano in Bali, but it’s sobering to think there may be hundreds of others going off, and almost certainly ones we don’t even know about. The article Is the Bali volcano making us warmer or cooler? by William F Jasper, reminded me of Ian Plimers words about there being squillions of undersea volcanoes so I found the 2007 paper, by Hillier, that tried to count them. Trying being the appropriate word. Volcanoes are biggish things, but when they are under one or two kilometers of water they are hard to hear, hard to see, and, by crikey, we know more about the moon than the bottom of the Marinara, and it’s only 11km “away”. The scope of our ignorance on the sea floor is really something. There are 1,500 active volcanoes on land, but on the sea floor we are still discovering them all the time. at least 39,000 of them rise one kilometer off the sea floor, but there are suspicions there might be up to 3 million, holey moley. 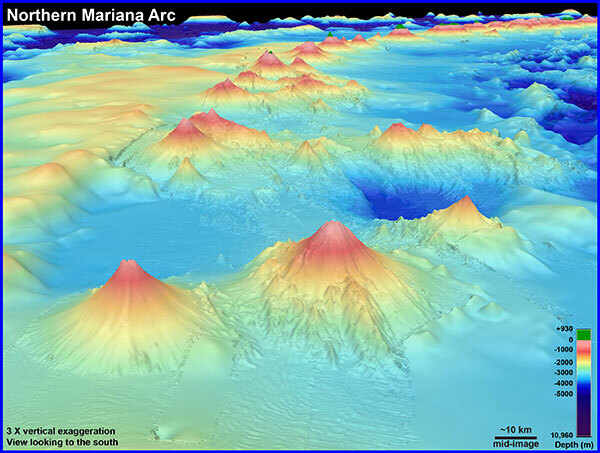 The Hilliers paper estimates that 24,000 submarine volcanoes were not yet discovered in 2007. Wikimedia is trying to list them. Good luck. Does hot magma leaking into the oceans that we havent measured and don’t know about, change the currents, the temperature, and eventually our weather? If it’s a bit hotter at one end of a trench than the other, does the water flow alter? Has the big ball of magma got anything at all to do with ENSO/AMO long term trends? Your guess is better than a Global Climate Model. So here is the closest thing we have to kind of being “A Map”. Is the Bali volcano making us warmer or cooler? I don’t think there is any chance the Bali volcano will be warming the world. But undersea volcanoes are releasing a lot of greenhouse gases. Time to tax them? Many of the undersea volcanoes are regularly oozing molten lava, as well as CO2, methane, and other gases. In addition there are untold thousands — perhaps millions — of undersea “vents” that are regularly discharging gases, oil, and tar. Last year researchers found hundreds of new vents along the west coast of the United States. “Scientists have found 500 seabed vents bubbling methane into the Pacific Ocean off the United States, roughly doubling the number of known U.S. seeps of the powerful greenhouse gas,” an October 19, 2016 Reuters story reported. As it happens, this week a new study came out showing The Next Big One may be sooner than we think. Though we have no idea when, but we used to think they were 45,000- 700,000 years apart. But now some new researchers think the new best guess is somewhere from 5,000 – 48,000 years. If the Big-One goes off, forget carbon, forget climate, forget a whole continent. On that basis, Professor Rougier says there is little need to plan now for a super-eruption, especially with many other pressing issues to address, which will affect the current and the next generation of humans. Though if you like, you can check out this volcano map. The distribution of submarine volcanoes, or seamounts, reflects melting within the Earth and how the magma generated ascends through the overlying lithosphere. Globally (±60° latitude), we use bathymetry data acquired along 39.5 × 106 km of ship tracks to find 201,055 probable seamounts, an order of magnitude more than previous counts across a wider height-range (0.1 < h < 6.7 km). In the North Pacific, seamounts’ spatial distribution substantially reflects ridge-crest conditions, variable on timescales of 10 s of Ma and along-ridge distances of ∼1,000 km, rather than intra-plate hot-spot related volcanic activity. In the Atlantic, volcano numbers decrease, somewhat counter-intuitively, towards Iceland suggesting that abundant under-ridge melt may deter the formation of isolated volcanoes. Neither previously used empirical curve (exponential or power-law) describes the true size-frequency distribution of seamounts. Nevertheless, we predict 39 ± 1 × 103 large seamounts (h > 1 km), implying that ∼24,000 (60%) remain to be discovered.